Wondering what to do with all that spare trim? Looking for an improved cannabis experience? You came to the right place! Here is how to turn kief into hash. Hashish results from the separation of trichomes from the cannabis plant. Although most trichomes are found on mature cannabis flowers, they can be sourced from all over the plant in smaller concentrations. This is the reason so many growers save their trim; they can extract all the trichomes holding the almighty cannabinoids and terpenes. These trichomes are then used to make edibles, or are pressed/heat-treated to form hash. Until recently, trichomes were referred to as simply “kief”. In fact, kief is technically the swollen crystal formation on the end of trichomes, which appear as microscopic, hair-like glands. It’s the additional procedures of hash-making that give the final product its distinct high, aroma, and physical consistency. Below, we’ll be showing you a few different ways of extracting trichomes and turning them into hash. Hand rolling is a process that normally occurs as a consequence of handling large amounts of cannabis buds and trim while harvesting. Basically, trichomes will stick to your hands, eventually forming a noticeable black layer of sticky resin. Once a decent amount of the material has been gathered, you can rub your hands together to form small spheres of hash. There is no specific amount of trichomes required to make hash this way, but it’s usually best to gather a lot, as they are quite small. Of course, the more trichomes you compress and roll, the more hash you’ll collect. Keep in mind: Depending on how clean the hands of the person rolling were, you’ll be collecting natural oils and dirt from the person’s skin, along with the cannabinoids and other good stuff. Most likely, however, you won’t taste the difference as the trichomes will dominate in terms of aroma and flavour. Kief is what most of us know as that good stuff you get on the bottom of your grinder. Indeed, this is one of the several methods of extracting it. We’ll be getting into more serious methods of doing so below. But now, it’s important to establish how to make hash once your kief is collected. You’ll need a pollen press. The pressure from this device will transform the kief into perfectly compressed hash. To make this process successful, gather as much kief as you can and load it into the press. Now, turn the knob as tight as you can. This part really does require you to put in some serious elbow grease. Once you feel it’s ready, screw the other side of the press off. Turn the knob until the hash pops out. The amber-looking cylinder that appears will be your hash. You can crumble as much as you want onto your next joint or bowl. Flat screening is also a relatively easy method, but you’ll be needing a silkscreen. The smaller the perforations are on it, the purer your hash will be. It’ll depend on whether you’re looking for quantity or quality. Put your cannabis in the freezer beforehand for a few hours. This will help the trichomes separate from the plant. Place your trim on the screen atop a clean and flat surface. Gently rub the plant material against the screen. All the trichomes will fall on the flat surface below. Do this for as long as you’d like. You should be trying to get at least 10% of the total weight of your trim in trichomes. You’ll probably have most of the materials for this one at home, but you’ll also need a silkscreen. Put your trim into a blender and add water until it covers your greens. Add plenty of ice and blend for around a minute. Once this is done, grab a glass jar and drain the mixture into it through the silkscreen. Let this sit for around half an hour. You’ll see the trichomes settle on the bottom of the jar. This is what you want. Try to empty about ⅔ of the water without losing any of the good stuff. Now, fill the jar again with ice water; let it settle for 3-5 minutes, then drain ⅔ of the water again. Repeat this process 4-5 times for top-quality hash. Finish by emptying as much of the water as you can from the jar, without losing trichomes in the process. Finally, you’re going to grab your coffee filter. Pass the solution through it; this should separate most of the water from the trichomes. Squeeze the filter to remove any excess water, then let the kief dry. What you’ll be left with is your final product. No need to press or heat it. You can enjoy it like this in a joint or a bowl! Dry ice hash is a method which extracts nothing but the resin itself. This is one of the purest methods of homemade hash-making around. For this cannabis science experiment, you’ll also be needing a bucket, dry ice, safe gloves, and bubble bags. These mesh bags should be perforated to fit your desired purity. A 73μm bag will give you the purest result with nothing but resin. If you increase to a 160μm bag, you’ll be gathering a higher quantity of product, as well as more plant material. This is not necessarily a bad thing, it just depends on what you’re looking for. Now that you have your materials, put your cannabis trim/flower in a large bucket with the dry ice. Stir and shake this lightly for a few minutes. This will help the resin glands separate from the plant material. It’s the temperature that causes this. Using dry ice is primarily to keep your product from becoming too humid. The next step will be to get your bubble bag and wrap it around the top of the bucket so that you can turn it upside down. Find a large, flat, and clean surface. Turn the bucket upside down, transferring all your product and dry ice to the bag. Once you have a safe and tight grip on the bag, shake it on top of your surface. After doing this for a few minutes, you’ll see the surface filled with amber-looking dust. Get a card and scrape it all together. This will be your resin, and it probably looks delicious. To turn it into hash, place in the pollen press and follow the same directions as above. You might’ve heard this name before, as this is a very popular extract in India, Nepal, and other regions. It is very similar to that of hand rolling, only charas derives from uncured buds and trim instead of already harvested material. For this, most growers will remove a few cuttings from plants that are 2-3 weeks away from full maturity. Others wait until it’s harvest time. From here, the process is the same as hand rolling. Rub the buds and trim gently between your hands until a thick coat appears. Charas will be smokable under most methods. You can add it to some flower in a joint, blunt, bong, or pipe. For those of you with a larger budget, there is an automated option that will save you both time and energy! It works similarly to the dry sifting method, but it’s all done by a machine. There will be a container where you’ll place your weed, which will be covered by a large silkscreen. The machine will shake this container, releasing all those delicious trichomes. To achieve the best results, freeze your cannabis three hours before you place it in. Once again, this process will only extract your kief. Use a pollen press or your preferred method to turn it into hash. As you can see, there are numerous methods of extracting pollen. Each technique can vary from grower to grower, but they all involve separating trichomes/kief from plant matter and compressing into a solid substance. Even this list does not cover the full breadth of methods used today. So how do you decide which one to use? You should take into account several factors. First, establish how much money you’re willing to spend. Some of these methods can be performed using materials you may already have at home. So you might as well start with one of those. If you don’t feel satisfied, you can purchase a silkscreen or bubble bags and try those methods. And if you still believe you can do better, then you can invest more than €300 in a mechanical drum. It will also depend on whether you’re doing this at a professional level or simply looking to upgrade your personal stash. We hope we’ve provided you with enough information to help you make a decision and get started making your very own hash! If you’re thinking of making a fresh batch of hash, then you should definitely consider using Royal Gorilla, but only if you can handle enormous levels of THC. This monster is the result of an ambitious growing project featuring parent strains Sour Dubb, Chem Sis, and Chocolate Diesel. 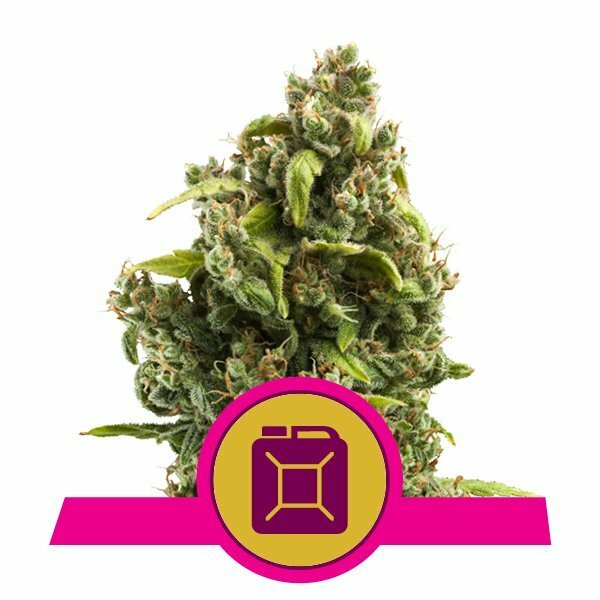 This strain shows no mercy and offers instant and long-lasting highs fuelled by THC values of over 25%. What’s more, she has a genetic makeup consisting of 50% sativa genetics and 50% indica genetics, offering a powerful effect that is equally balanced between the domains of the body and mind. The sativa elements wake up the brain and open the gates to in-depth creative thinking and problem solving, whereas the indica aspects send a warm and comforting feeling into the muscles. This award-winning variety pumps out large quantities of resin during the flowering phase of the grow cycle, making her a dream for growers that like to hand-rub hash fresh from the flowers. This highly psychoactive hash can be moulded into balls and blocks, and gives of pleasant scents of earthiness and pine. Royal Gorilla favours a warm climate and will produce more resin for hash production if provided with these settings. Indoor plants raised within grow rooms or tents have the capacity to reach heights of 160cm and put out large yields of 550g/m², considering adequate lighting and nutrients are provided. Plants cultivated in larger outdoor spaces will grow to slightly taller heights of 170cm and produce yields of up to 600g/plant. Growers should expect to harvest and trim these flowers during the middle of October. Royal Gorilla has a flowering time of 8–9 weeks. Hash is known for producing a euphoric and buzzing high, so it only makes sense to select genetics that are going to emphasise these effects. Sour Diesel will certainly accomplish this task. This sativa-heavy strain consists of 70% sativa genetics and 30% indica genetics, giving her a fiery and energetic kick that goes hand in hand with the “upper” effect of good-quality hash. She is the result of a diverse lineup of strains including Original Diesel, Northern Light, Shiva, and Hawaiian. Smoking a joint loaded with her flowers will catalyse a clear-headed and lucid high that boosts alertness and critical thinking. Hash crafted using these flowers unleashes taste bud-teasing flavours of herbs and sourness. Sour Diesel produces small and compact bright green flowers that form neatly shaped nuggets. Upon closer inspection, growers will be happy to witness high numbers of trichomes that pump out large quantities of psychoactive resin. This trait makes her a high-performing hash plant. Simply get rubbing away to collect the good stuff. Sour Diesel thrives in a mild to warm climate and performs well indoors and outdoors. Indoor plants offer generous yields of 475–525g/m² and grow to heights of between 90–160cm. Outdoor plants produce yields of 600g/plant and achieve heights of 200cm. Plants grown outdoors will be ready for harvesting and processing during late October. Sour Diesel has a flowering period of 10–11 weeks, but the wait is worth it. ICE, otherwise known as Indica Crystal Extreme, is named after her massive trichome production. The large and bulbous flowers of this strain look as though they have endured snowfall, but in fact it's just huge amounts of resin! It’s as though this specimen was designed entirely for hash-making; each rub will leave layers of viscous resin glued to the palms of the hand. It won’t take long at all until you have a large temple ball constructed. Her stellar hash genetics stem from parent strains Afghan, Northern Light, and Skunk. This mix has created a highly indica-dominant strain that provides an instant body high when inhaled. The effects are relaxing, meditative, and therapeutic. Smoking this hash in a candlelit room in the evening is a one-way ticket to calming euphoria. Each hit is enriched by flavours of spices, herbs, and mint. A THC value of 18% ensures satisfying highs that aren’t overly intense. ICE grows well both indoors and outdoors, providing rewarding outcomes in either environment. Indoor plants turn out yields of up to 450g/m² and stretch to heights of 120cm. Their outdoor counterparts achieve yields of between 500–550g/plant and taller heights of 200cm. Expect to be harvesting outdoor crops during September. ICE has a flowering time of 8–10 weeks.